Do you want to give your children a head start in life? 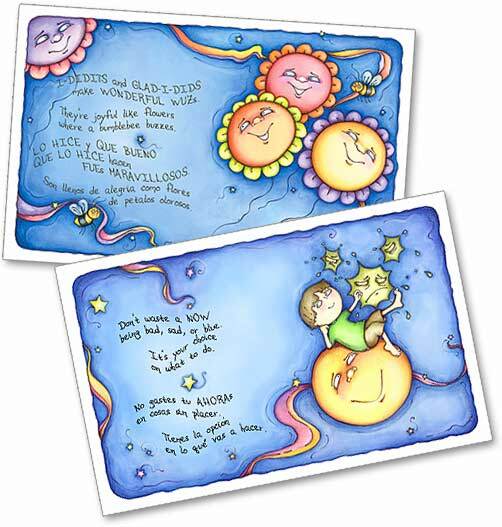 Dr. Hope’s award-winning empowering storybooks will give your child self-esteem, teach them the power of believing in themselves, the joy in helping others, the love of laughter, to always try their best, and the benefits of living in the present moment. 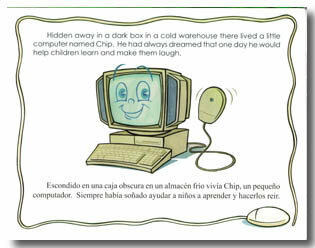 "Laughing Day is charming and does exactly what you say it will (delivers a message that will help children throughout their lives)"
Chip, the Little Computer is an endearing story written side by side in both English and Spanish. 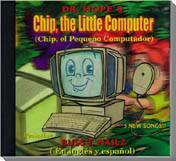 Chip has a dream: to help children learn new things and to make them laugh and play. His story starts out in a cold, dark warehouse. 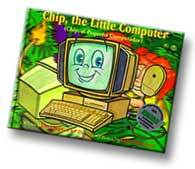 After countless disappointments, Chip is told by a wise old copy machine to have faith in his dream. He learns the power of determination that comes from believing in your dream no matter what happens. The story has a surprise ending. Oolong must pass through the scary Dark Forest in order to get to the Grumpies’ village. 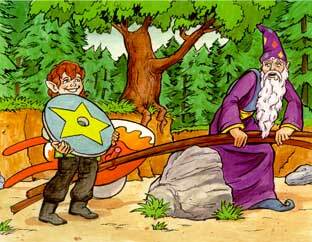 Along the way, he learns a valuable life lesson from a wise old man who helps him when his pushcart looses a wheel. Oolong teaches this lesson to the Grumpies he encounters. A marvelous and wonderful thing happens when he returns home for the Laughing Day celebration. 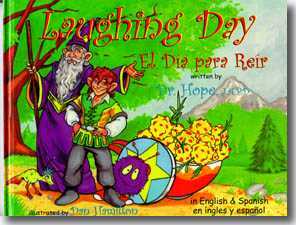 On the CD: Russ T. Nailz and other talented voice actors (Dr. Hope is one of them) act out the Laughing Day story. In addition, there are 5 original heart-warming and humorous tunes are included. it's your choice on what to do." 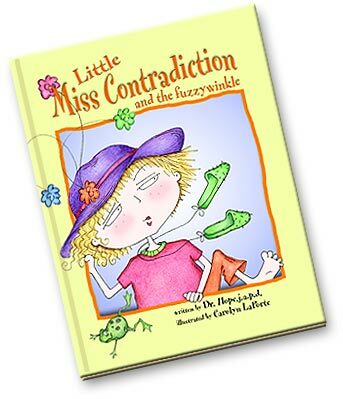 Little Miss Contradiction and the Fuzzywinkle is a delightfully off center book is the first in Dr. Hope's Silly Series. 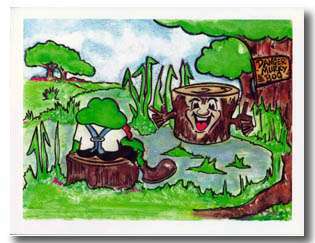 The storybook is full of wacky contradictions that make you laugh and think. 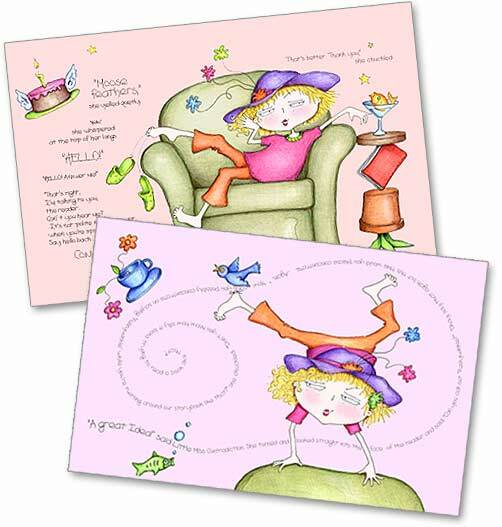 The madcap plot is simple: Little Miss Contradiction has misplaced her Fuzzywinkle and rummages around to find it. She, “runs downstairs, bare-footed with her pink slippers on, steps into an empty bucket, half full of blue cherry soda...etc." 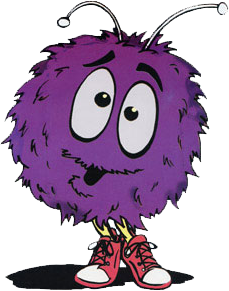 In this manner this charming character searches for her lost Fuzzywinkle throughout her home and neighborhood. Everything is a contradiction from her steal wooden door, to her bare carpeted floor. Amusing and enjoyable this storybook is beautifully illustrated to underscore the hilarity of the inconsistencies it contains. 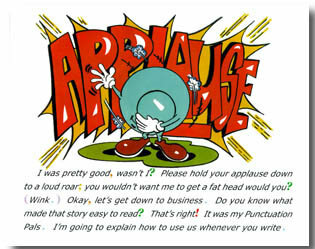 Punctuation Pals is an entertaining way to learn how to use punctuation. 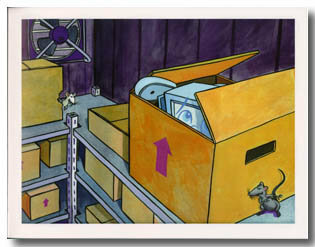 Cool art and interactive stickers makes this a must have for any youngster's library. 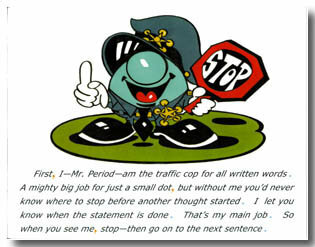 Mr. Period, the narrator, tells a humorous story in which common punctuation marks are used. After the story he explains that it was his 'Punctuation Pals' that made the story easy to read. He introduces himself as the traffic cop for all written words and shows where and how to use himself. He does the same for his 'Punctuation Pals' in a way that makes there usage easy to understand. All the punctuation marks are color coded (Like this: blue for the period; red for the exclamation mark; green for the question mark, etc.) to aid in learning there placement and proper usage. At the end of the book there is an interactive short story with no punctuation but with specially color coded underscore lines. In the back of the book are reusable punctuation stickers that can be placed and replaced into that story. This book is a lot of fun for all ages! 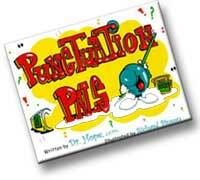 Dr. Hope's Punctuation Pals features delightfully colorful illustrations by cartoonist/illustrator, Richard Pinson. Order your high quality hardcover copy today! Thank you for your investment in your children. 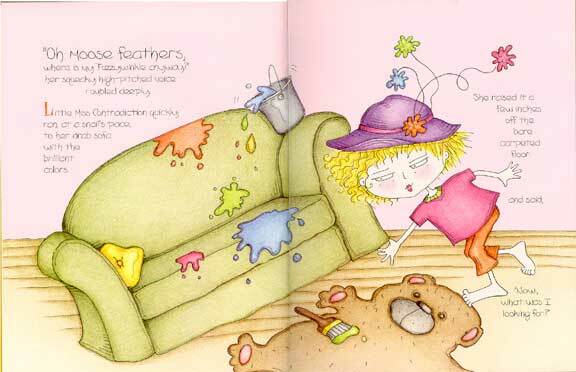 Borger News-Herald: "I highly recommend this adorable book for any young child." 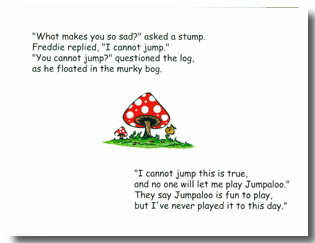 Palestine Herald-Press: "The Frog Who Couldn’t Jump is a good pick for your little one’s bedtime story." Shelbyville Times-Gazette: "Dr. Hope, J.A.P.D. may be 'Just A Pretend Doctor' but the author’s wisdom is sure to make parents and youngsters feel better in a brightly colored new children’s book, The Frog Who Couldn’t Jump." The Shawnee News Star: "I recommend The Frog Who Couldn’t Jump to parents who enjoy quiet reading time with their children and who are concerned with helping their children build character by learning the true meaning of being a winner. 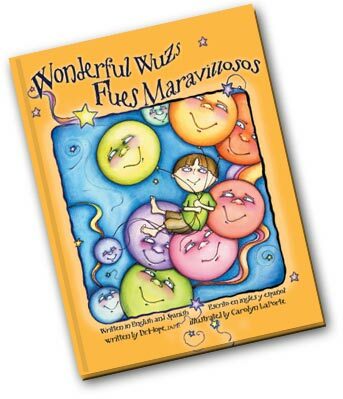 It is a great find and an easy read for children." 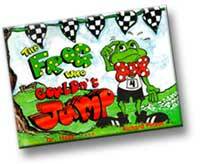 Newspapers in Education-Morning Journal: "The Frog Who Couldn't Jump may be a leap ahead of other children's books." 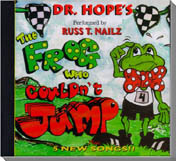 On the CD: Russ T. Nailz and other talented voice actors (Dr. Hope is one of them) act out Freddy Frog’s story. In addition, there are 5 original heart-warming and humorous tunes are included. Thank You! You can connect with Dr. Hope on Facebook, Twitter and YouTube. In this short video Dr. Hope tells how you can win FREE children's picture books by helping the less fortunate in your community. Please take a quick look. © Copyright 2013 Alpine Publishing, Inc.